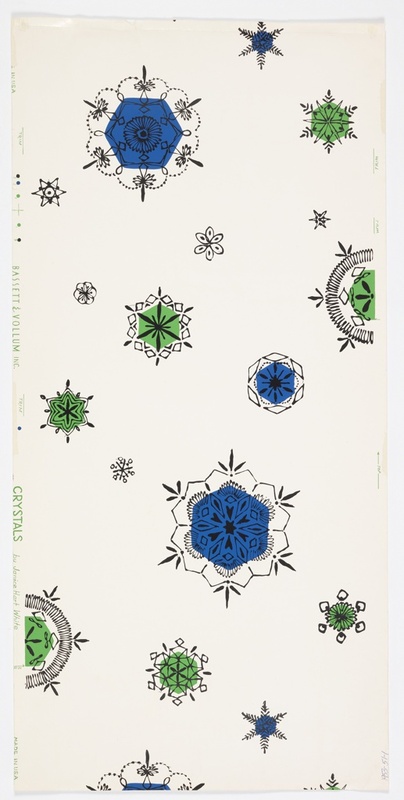 This mid-century design of crystalline structures takes on the appearance of falling snowflakes, with the varying scale of the crystals giving the design some dimension. The design is fresh and still appears modern today with its strong graphic quality and saturated colors on a stark white ground. The wallpaper contains more than one repeat and includes fourteen different crystal motifs, each one having a unique structure. Each of the crystals was drawn with six points and all but the smallest ones have a brightly colored blue or green center. Titled Crystals, without identifying any specific crystals, snowflakes are a recognizable form, based on our familiarity with them and early childhood memories of cutting paper versions. This pattern is part of a trend as designers began looking for new sources of inspiration appropriate for the post-war period. In 1949 the British Council of Industrial Design invited a group of manufacturers to create patterns based on structures identified by X-ray crystallography for the 1951 Festival of Britain. Crystalline structures have been long admired for their symmetry but no scientific investigations began until the 17th century. Interesting coincidence, but a snowflake was the first crystal structure discovered. The discovery of X-rays in 1895 further advanced studies in this field. X-ray crystallography, developed in 1912, identifies the atomic and molecular structure of crystals, as the crystalline atoms cause a beam of X-rays to diffract in many directions. By measuring the angles and intensities of these diffracted beams, a crystallographer can produce a three-dimensional picture of the density of electrons within the crystal. To further investigate the type of crystal rendered in this design I found a picture of a snowflake structure as revealed by X-ray crystallography. If you colored in the central hexagon with a splash of blue or green, it would blend beautifully within the existing pattern.